The Charles Hulcher Company was founded in 1952 by photographer Charles A. Hulcher (1910-1994). The company developed panoramic cameras, press cameras and specialized cameras used in aeronautic and military applications. 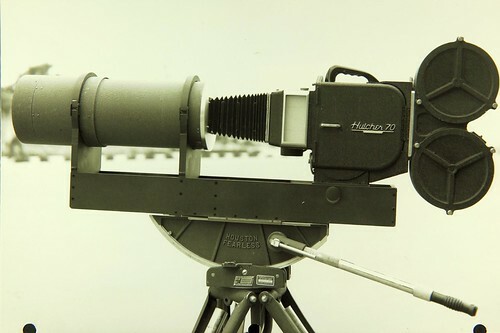 The Hulcher 35 model 112 illustrated dates from the 1970s, and is a 'sequence camera'; intended for making short series of exposures at a high frame rate, from which stills can be selected. Hulcher 35 model 112 sequence camera, serial no. 33, with frame rates up to 20 FPS, sold at the 22nd Westlicht Photographica Auction, on 24 November 2012. This camera has been converted to use Leica R-mount lenses, and belonged to Prof. Franz Hoppichler, who used it to make the illustrations for skiing instructional books. This page was last edited on 26 September 2016, at 05:15.